It was an apt ending to Margaret Gosling’s life, which was filled with flowers, that her funeral on December 18 took place in St. Andrew’s church, bedecked with Christmas flowers and floral decorations. 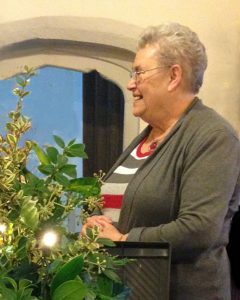 Born in East Dundry, Margaret inherited her love of flowers from her mother, who was an accomplished flower arranger, and a co-founder of the Chew Valley Floral Decoration Society. After attending Dundry village school, Margaret started a family tradition by going to Redland High School for Girls. Leaving at 17, she took a job at Long Ashton Research Institute, involved in research on the growth of fruit, and, with day release to college, gained her Licentiate of Royal Institute in Chemistry. Wreath making for the new village hall.